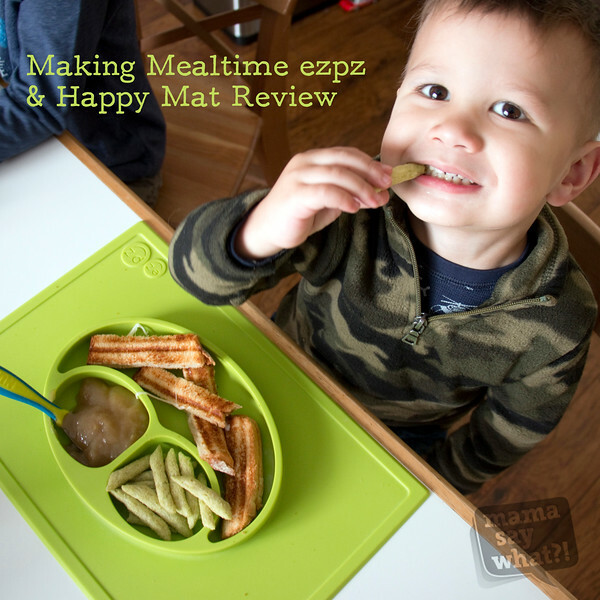 Making Mealtime ezpz Book & Happy Mat Review Mama Say What?! | Mama Say What?! I received this book along with an awesomely bright green ezpz Happy Mat; this being my first review as a Brand Ambassador for the Guidance Guide, a product reviewing gig that was created by TheBabyGuyNYC and Jennifer Buske. It’s chalked full of real parents giving their honest opinions on baby and kid products. I have wanted to buy a Happy Mat ever since Jamie Grayson (TheBabyGuyNYC) posted a video about them from the ABC Expo a couple of years ago. 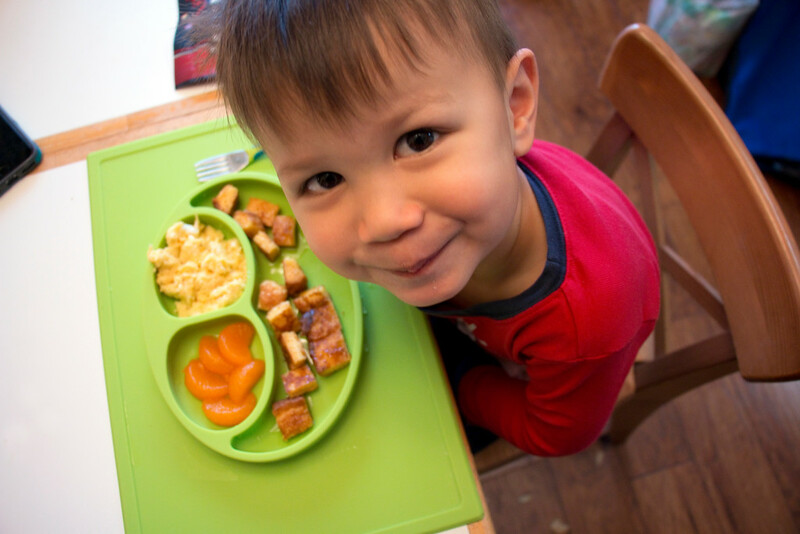 My oldest son was never really a messy eater and not the type to throw his plates on the floor, so we really didn’t need one. At the time, I couldn’t justify $25 for it. Then my youngest was born and I added one to his wishlist with plans to buy it once he was eating solids with us on a regular basis. This winter we were given the opportunity to try one out along with the nifty new book that the folks at ezpz created. My first impression of the book was curiosity, for some reason I was expecting more of a cookbook. 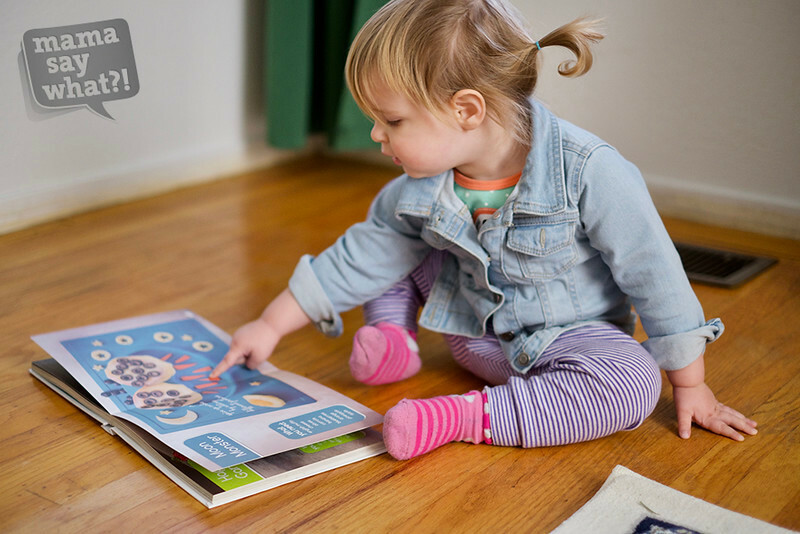 The pages are thicker than usual, almost like a child’s board book, so I figure toddlers are included in the target audience and are encouraged to flip through the book too. My youngest is 2.5 and my niece is almost 2 and they both thought it was a pretty fun book. They flipped through it pointing out the fruits and vegetables he recognized and asking what some other foods were. 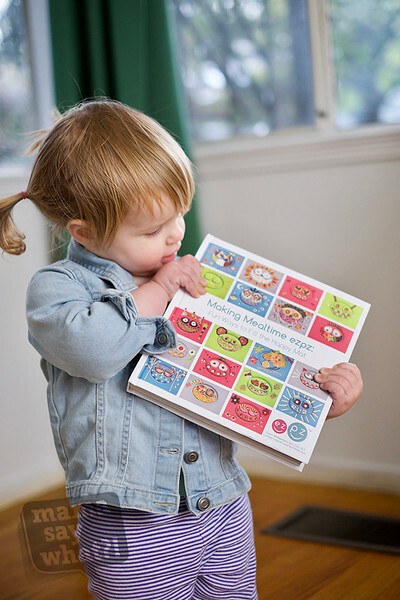 The book is a combination of a couple of concepts: education on instilling healthy eating habits in toddlers and working with picky eaters. There’s emphasis on using the Happy May to make food look fun and hopefully encourage kids to explore and try new foods. 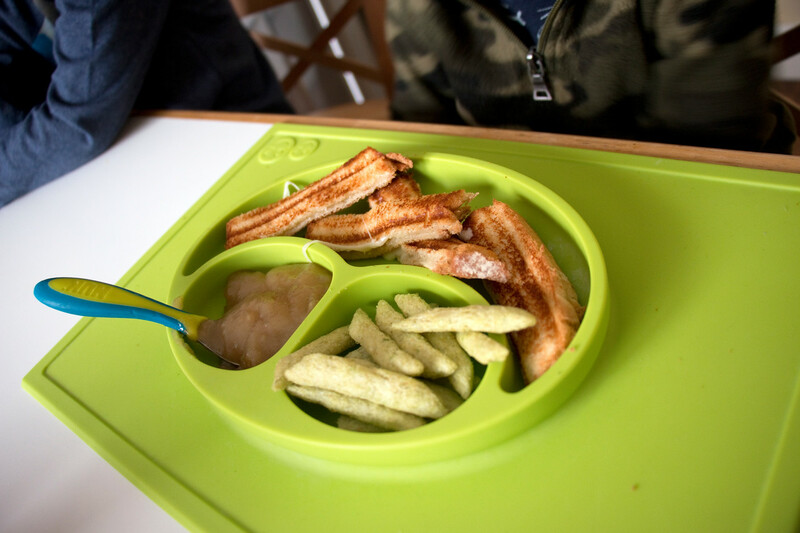 Some concepts include cutting foods into fun shapes and laying foods out on the Happy Mat to follow a theme. Grocery shopping lists are also included, which is really nice. This book has some really fun ideas and is beautifully photographed, but in all honesty, I felt the concepts inside I could easily find on Pinterest or other websites that are references for healthy eating. The information is really fantastic, but as a mom to two boys and a foodie myself, it’s not really new information to me. Most of the advice is already in practice in our home. If I was a first-time-mom struggling to get my toddler to eat anything other than mac n cheese and bread, then I could see this being helpful. 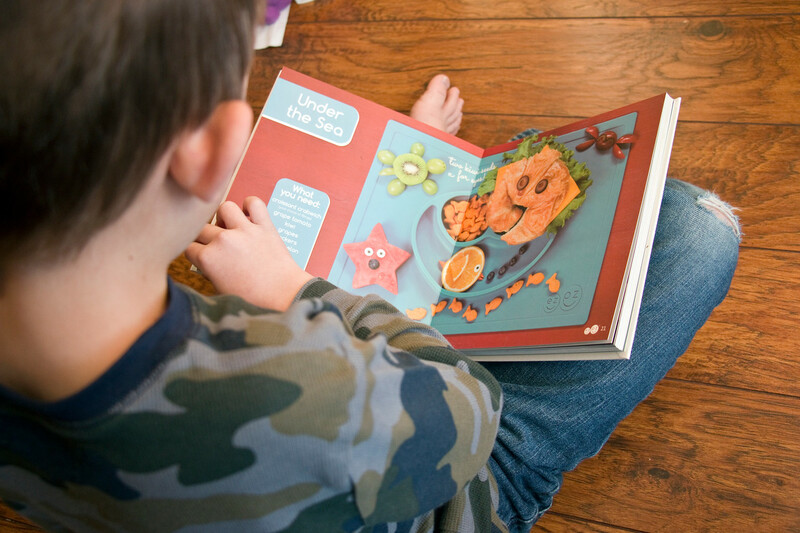 I could see this book being really wonderful for parents of kids with sensory processing issues when it comes to food and textures. I could also see this book being a really helpful tool for nannies of young children. But this is information I would expect to see on a website or blog and not really in a printed book. My seven-year-old thought the book was wonderful to sit and read. So there’s that. The Happy Mat itself is really fantastic. It’s durable, really sinkin’ easy to clean (bottom rack of the dishwasher! ), and it really stays put on our kitchen table. I love that it’s both the plate and a placemat, which makes messes a little easier to clean up. We are firmly in a phase where my 2.5 year old would rather play than do absolutely anything, including eat. We often have days where he will take a few bites of anything throughout the day and then he melts down at dinnertime because he’s starving. With the new Happy Mat, he seems to sit at the table much longer and eat more of his meal than when it’s presented on a regular plate. We like it so much, we are really considering buying an ezpz Happy Bowl next. Even my parents are considering buying a couple of Happy Mats for when their grandkids are visiting. My final thoughts: Buy the Happy Mat, it’s definitely worth the cost. I would only consider the book if you’re looking for information on nutrition and dealing with a picky toddler and you haven’t found what you’re looking for elsewhere on the web. If you buy the book together with a Happy Mat from ezpz’s website, you can get $5 off. Nice! Disclaimer: I was given this mat and book to review, but all opinions are my own. Affiliate links are included and help us keep our site running when used. Added by Alex T. on January 22, 2017.